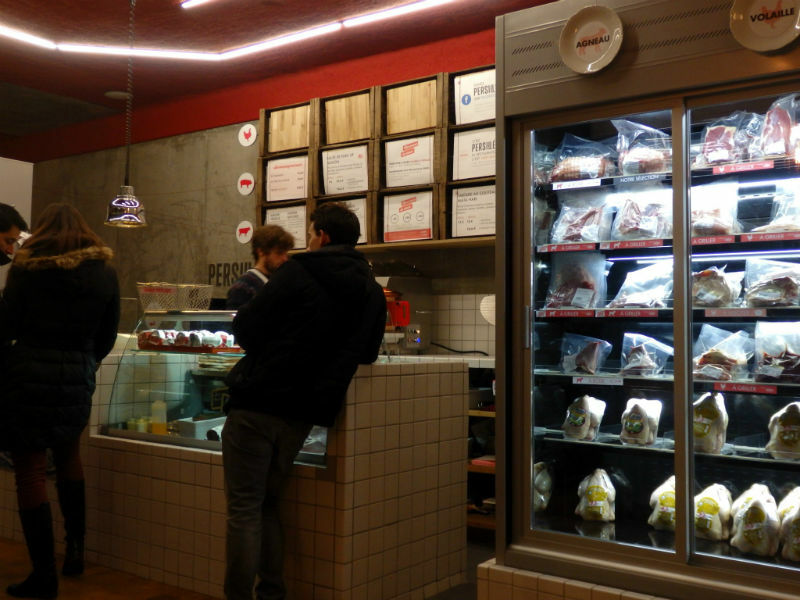 As the French are real carnivores, there is no shortage of butcher shops in Paris, but up until now I have never come across one that also doubles as a casual dining/fast food joint! 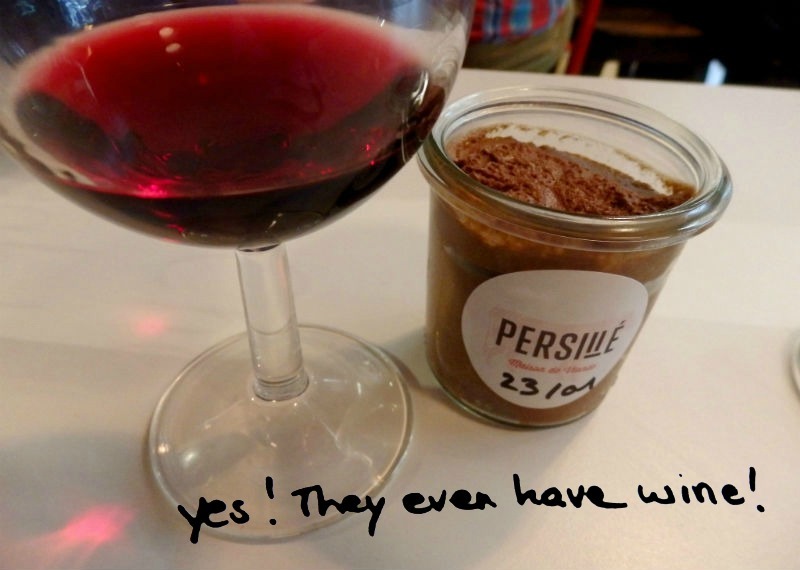 That is exactly what the two young men behind Persillé – Maison de Viande (translation: House of Meat) decided to do, and they do it well. I passed by this place a week ago on my way to the MK2 Bibliothèque movie theatre with my bf (where I go fairly often and am always saddened by the lack of places to eat nearby) and was immediately intrigued by their innovative concept. At first glance it looks like a bright and modern butcher shop, with two large, well-stocked refrigerators (filled with various types of meat and poultry), but once you see the wooden tables and the menu posted on the wall behind the white tiled counter, you realize that there is more to this place than meets the eye. You are, of course, more than welcome to buy a piece of Charolais beef or some pork from Auvergne to take home and prepare as you like, but at Persillé there is also the option of having that same meat prepared for you with care by their chef, and served with a choice of sauces and sides. 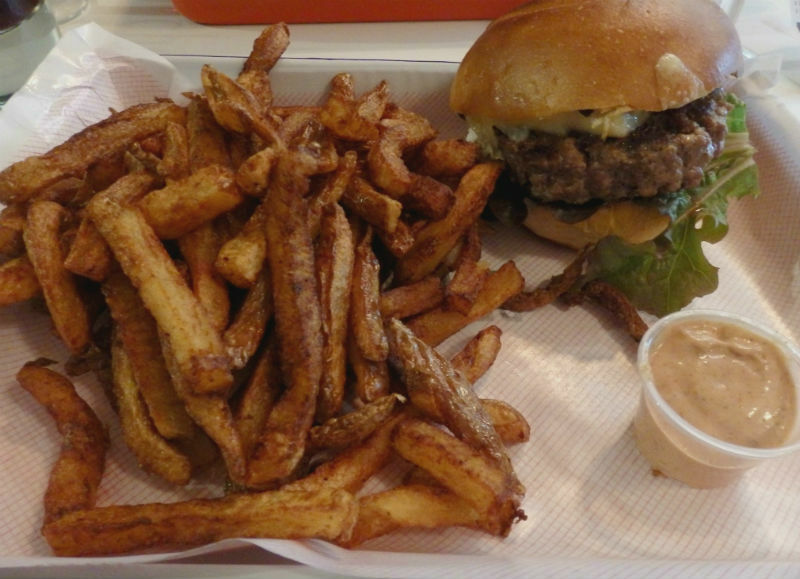 We decided to try one of their burgers, made from their freshly ground beef and cooked in their kitchen. We sat down at one of the tables by the window with a line full of cured sausages hanging above us. The burgers came served on cute little metal trays with a generous pile of soft fries and their homemade (and totally delicious) tomato mayo spiced sauce. I chose the Persillé burger: a thick and tasty medium rare burger in a lightly toasted bun with a creamy parsley sauce, a slice of Emmental cheese and some salad greens. Super yum! My bf had the butcher burger with smoked pork belly, aged cheddar, lettuce, and a tomato and onion sauce. I managed to try one bite before he devoured it, and found it just as good as mine! 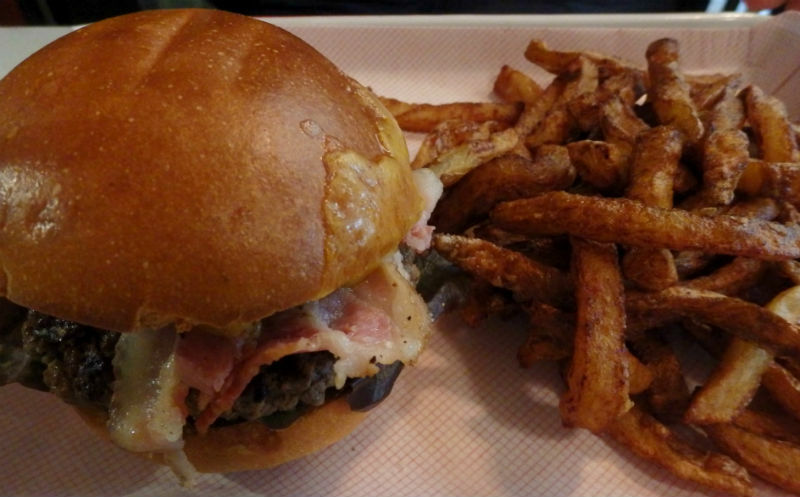 The burger, fries and a drink specials range from 14-15 Euros each…not bad! They even have bottles (or glasses) of wine, which we ordered and enjoyed with a chocolate mousse (they have a selection of dreamy desserts for 2.70-3.50 Euros each). I took a quick tour of the place before leaving, past a deer head mounted on the wall and down the stairs, to find an additional seating area as well as the kitchen, concealed behind plastic strip curtains (the kind you would find when entering a walk-in freezer). 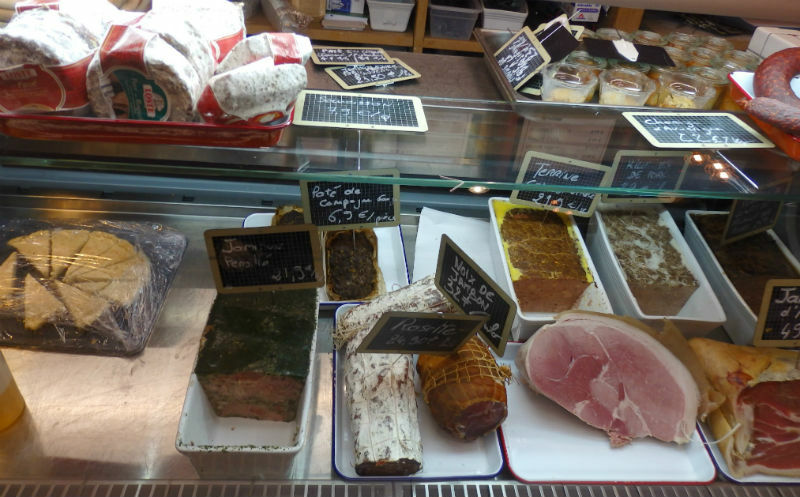 For those of you more interested in their product for sale, they have a great selection of pâtés, sausages, salami, and hams, as well as cuts of chicken, lamb, pork and beef. For me though, it’s all about their burgers! 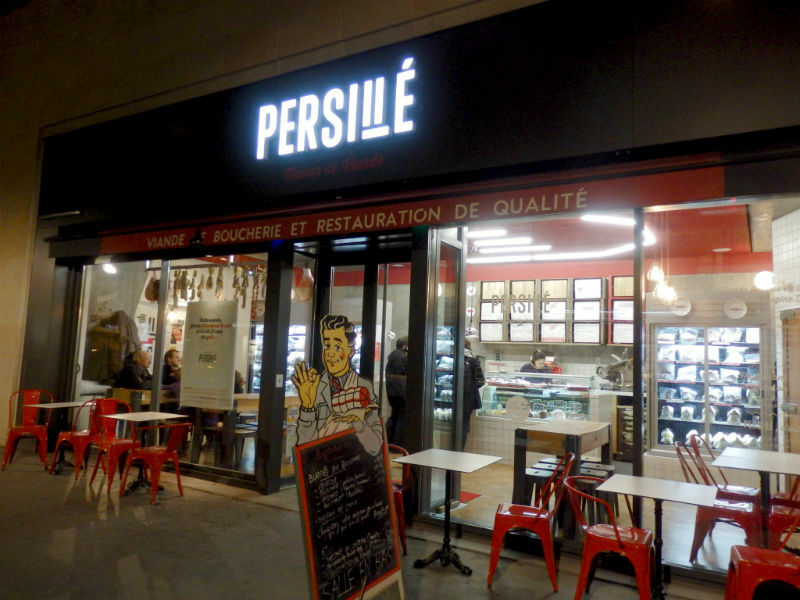 So if you’re in the area and need to grab something quick to eat that doesn’t feel like fast food, then I would definitely recommend Persillé: a butcher shop unlike the rest! The guys are friendly and their burgers are pretty satisfying. Oh! And in case you’re wondering what movie I saw, it was Foxcatcher, which I recommend by the way! Steve Carrell was completely transformed in his role as the creepy John du Pont and all three main actors gave really powerful performances! Check it out! Categories: Uncategorized | Tags: burgers, butcher, foodies, homemade, meat, Paris, restaurants | Permalink.